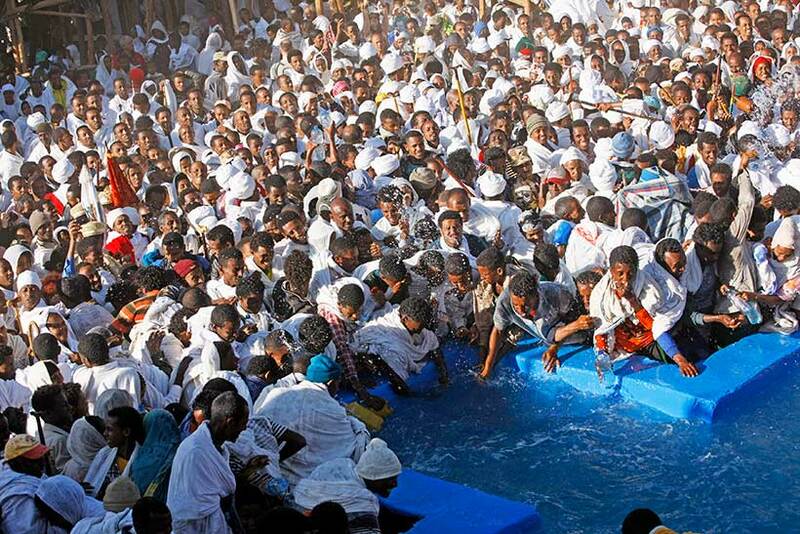 The Timkat Festival is a highlight of any visit to Ethiopia. 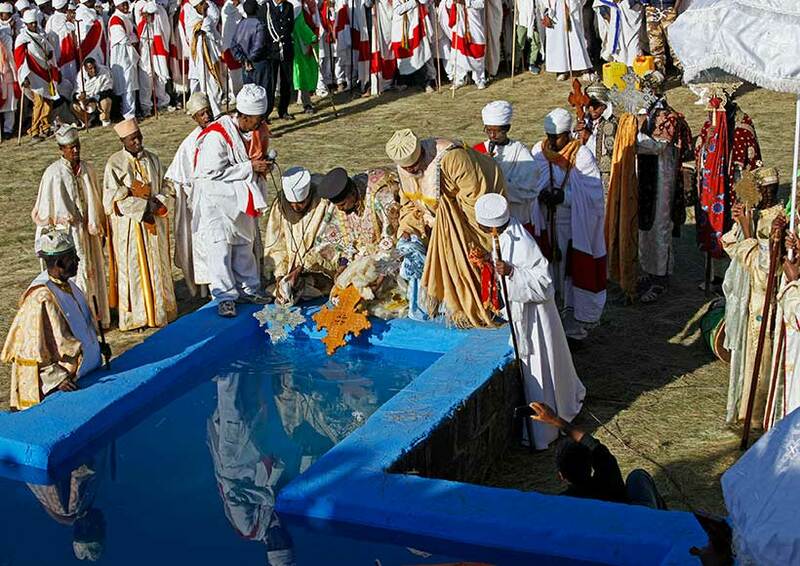 Celebrating the Baptism of Jesus by John the Baptist, it is one of the most important religious events in the Ethiopian Orthodox calendar. It is celebrated throughout Ethiopia but the most special place to experience Timkat is in Lalibela with its ten 13th century rock carved churches. Each of the churches participates in what is an explosion of spontaneous religious fervour mixed with sheer exuberance. Processions start from each of these churches, and converge like the meeting of rivers in spate. There are drums, horns, chanting, ululations, and dancing. Each procession is preceded by groups of young men waving their traditional wooden staffs and gyrating in circles as they move along. The priests follow in their gorgeous vestments, holding vividly decorated umbrellas. 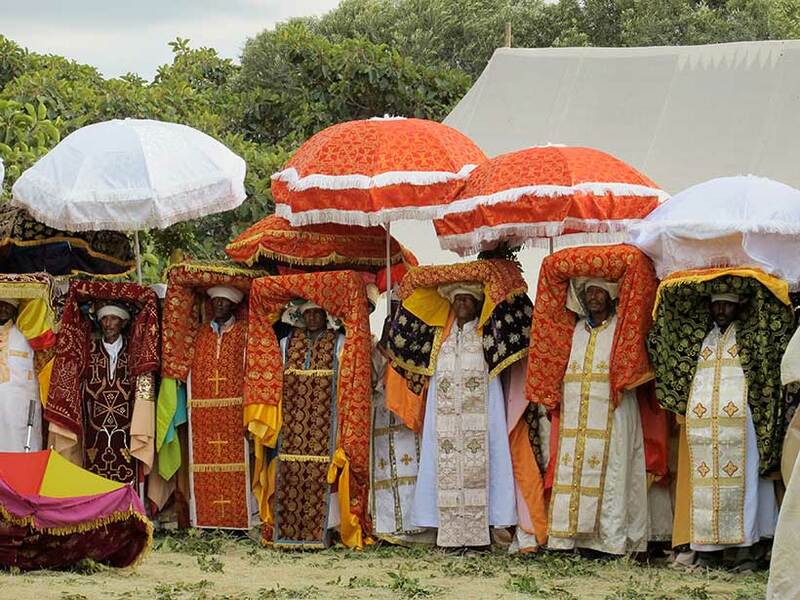 Centre piece of each procession is the Tabot, wrapped in exotic fabrics. The Tabot is a replica of the Ark of the Covenant. 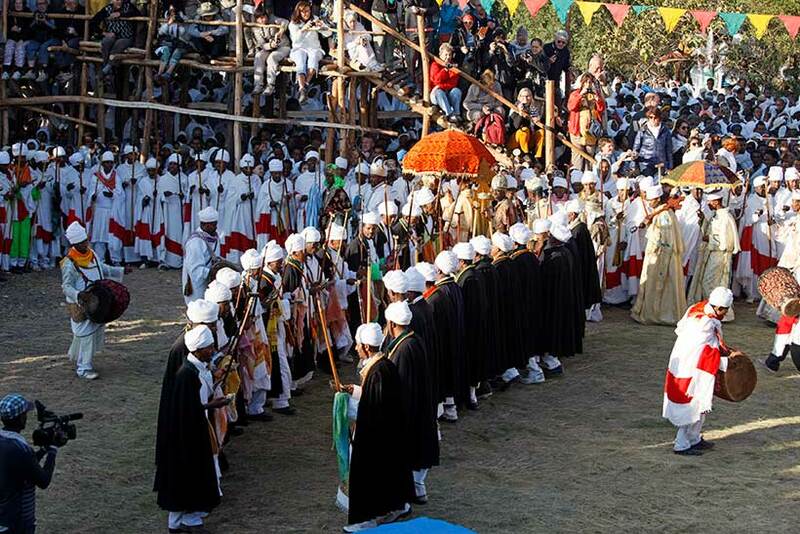 According to tradition the original Ark is kept at Axum in the far north of the country. Crowds of energetic men and women surround and follow the core of the procession. The sound is deafening and the excitement is extreme. 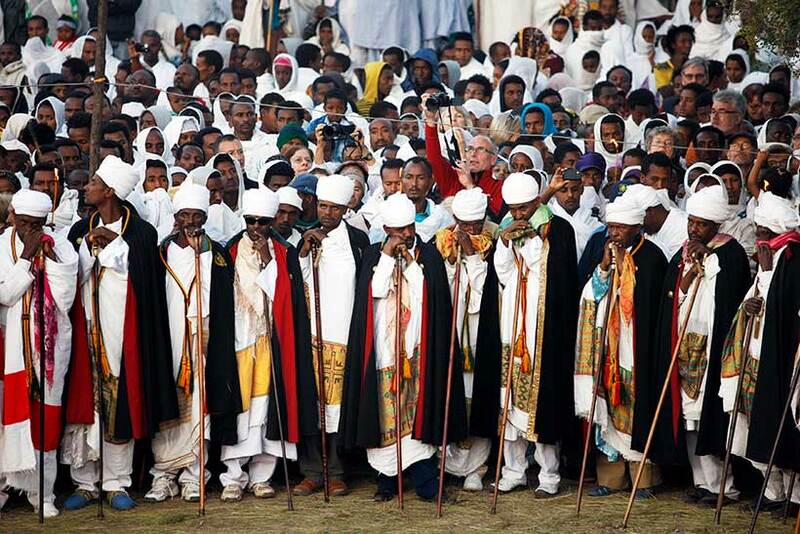 Most of the Ethiopians are swathed in white fabric, and have a biblical look – until, that is, you see their mobile phones in operation. They are as keen as the tourists to capture the experience. 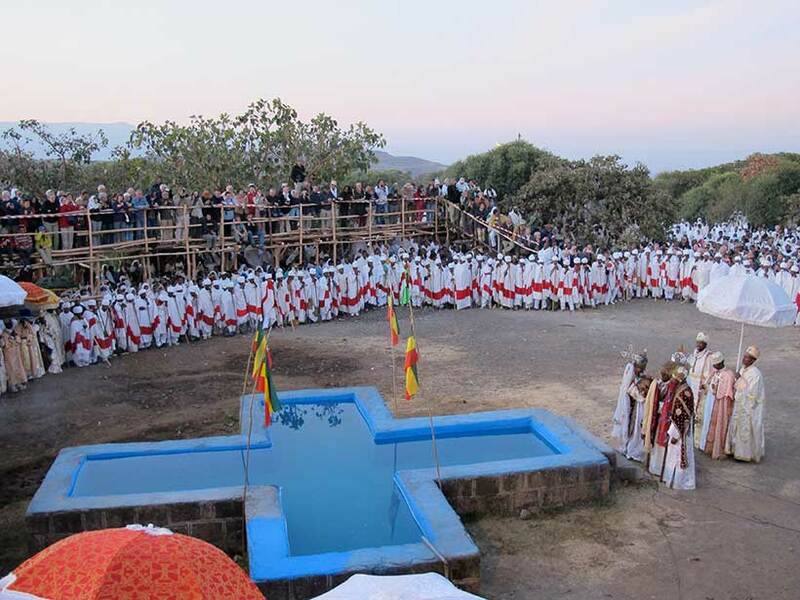 The procession proceeds to the Church of St George, the most iconic of the rock churches, in the shape of a cross, the Bete Ghiorgis is carved out of red granite from the top down so that only the summit protrudes above the surrounding countryside. Access to the church is down steep and slightly hair raising steps, along a narrow cut in the rock, and through a stretch of tunnel. Once you clear the tunnel you are in a space surrounding the monolithic shape of the church. Colourful murals liven the atmosphere. You can hear the drums and chanting throughout the night of Vigil. Ethiopia tours are for small groups of up to 216 or private groups of 4 or more.